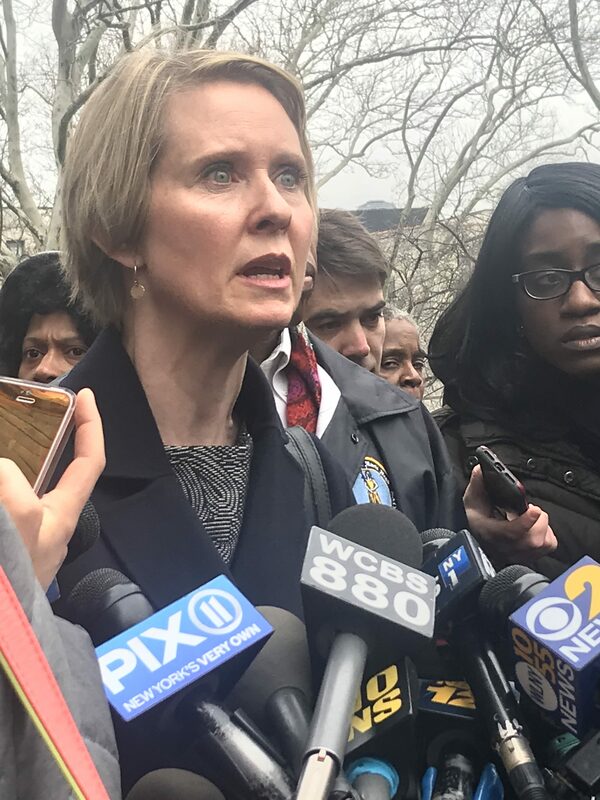 CROWN HEIGHTS – On her first visit to a NYCHA development, gubernatorial hopeful, Cynthia Nixon, blasted Gov. Cuomo for his handling of the New York City Housing crisis. A week after Gov. 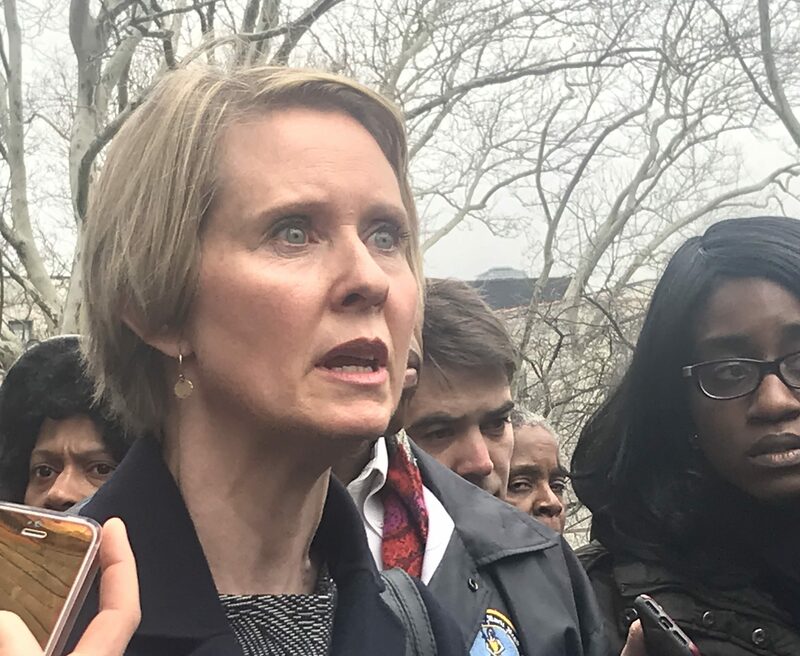 Andrew Cuomo (D) conducted a tour through New York City Housing Authority complexes in the Bronx, Democratic opponent Cynthia Nixon (D) held her own NYCHA inspection of Brooklyn’s Albany Houses this morning. Nixon went on to talk about one wheelchair-bound resident who is unable to maneuver in and out of her inaccessible apartment because the doorway is too narrow. “She’s literally trapped in her home,” said Nixon who condemned the state of NYCHA developments as not only a housing crisis but also a health crisis. Nixon maintained funding as the primary fix to the NYCHA issue and condemned Cuomo for not allocating $100 million to repair roofs throughout the housing system in 2015. The candidate went on to criticize the incumbent’s most recent pledge of $250 million to NYCHA calling the act an attempt to placate his top supporters. “He’s saying that money has to go through companies that are major donors to his campaign,” said Nixon. Cynthia Nixon with Brooklyn Borough President Eric Adams. 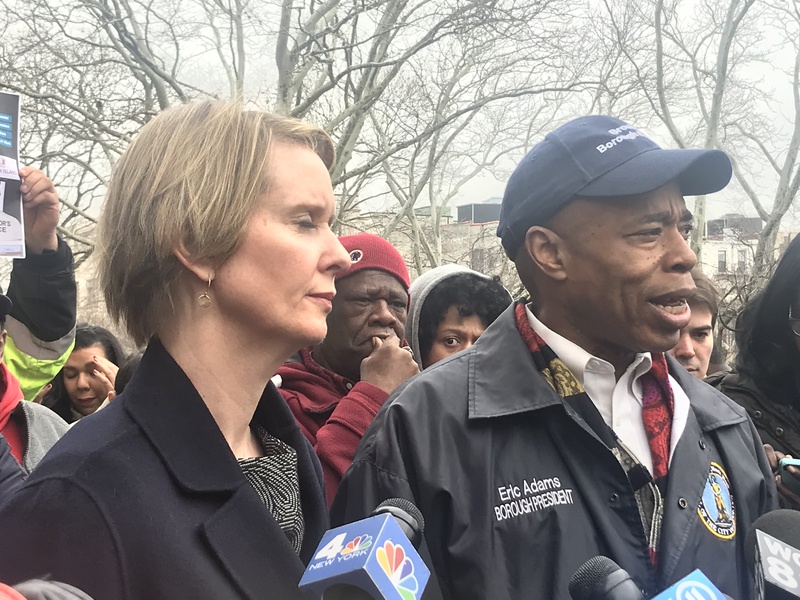 Last Tuesday, Brooklyn Borough President Eric Adams invited Nixon to tour a NYCHA development and hear first-hand from tenants who have lived through what he called years of government neglect. Nixon visited apartments of three tenants, all of which complained of leaky pipes and peeling walls from water damage, which are both susceptible to mold. Long time tenant Diann Wise, 76, told Bklyner during a phone conversation that outside of leaky walls and pipes her biggest fear comes from frequent electrical outages in her apartment. “Every time someone flips the light on in my grandson’s room the entire apartment goes dark,” said Wise. 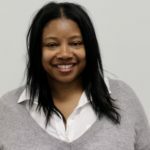 The 30-year NYCHA resident said she lost three brothers to a fire when she was 8-years-old and for that reason is highly sensitive to potential electrical hazards. Wise said an hour after Nixon left her apartment, management stopped in to say they would be addressing her repairs immediately.